Midoriyama is located in the northern part of Okayama, a northeastern part of Tsuyama Basin. Tsuyama feudal clan is abolished in 1871, it becomes Tsuyama Prefecture, then all over Mimasaka erea becomes Hojo Prefecture,Finaly Hojo Prefecture has been amalgamated by Okayama Prefecture in 1876. After that, Tsuyama has been decreasing her importance as a distrbuting place of commodities compare to southern counterpart Okayama which advanced in transportation. In 1975, part of the Chiyugoku expway between Suita to Ochiai was opened.Synchronizing that, development of industrial estate had been promoted in Tsuyama erea. Today,there are lots of industrial complex there along side of Chiyugoku expway here in Tsuyama erea which used to be no worth mentioning industry there. Industrial complex in Midoriyama is one of those examples. Midoriyama is a nickname of the village section, the hill is part of Ayabe Tuyama City in properly calling. 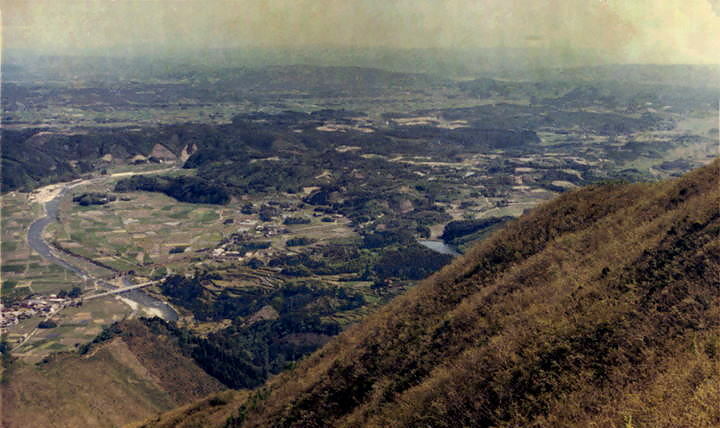 In the part of Tsuyama basin, there are many line shaped hills run from north to south there.Those are 150m to 300m in height and approx 50m from the bottme.These hills consist of the stratum which formed in third cenozoic era. It is thought that the sea stretched around here about 15 million years ago. The sea expanded the central low ground belt that ran from east to west in the Chugoku mountainous district, and the shallow sea that was called Tsuyama sea was formed in the middle term of the third cenozoic era as for the vicinity in a present Tsuyama basin. Teeth fossils of shark's named Calcarodon and coral fossils, etc. have been discovered from the todays vicinity with the Kusakabe industrial estate. The age descends, to ancient times since primeval days, these hills were places of the best village location for people at that time. 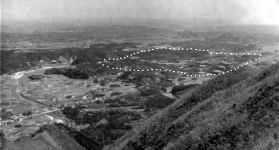 Jomon and Yayoi era, Ruins of both ages have been discovered around Midoriyama, also steel manufacture ruins called the Midoriyama steel manufacture ruins which consist two steel manufacture furnace discovered in this Midoriyama. These evidences show us human activities from the old times here in Midoriyama.